Using Kreinik threads in your knitting has one purpose: take your designs from ho-hum to gorgeous. As carry-along fibers, Kreinik metallic, Reflective, and glow-in-the-dark threads add light, color, visual interest, and special effects to plain yarns. Does it seem like your knitting project is "missing something"? This is the solution. Go subtle or bold, classic or trendy, combining colors to match outfits, team sports, or room decor. Lace knitting or bead knitting? 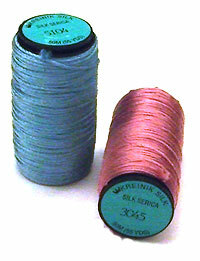 Kreinik threads have the ideal weight, strength, and color to make designs more stunning.